Las Vegas. The Strip. To the untrained eye, it's a sleepy desert crossroads. A wasteland of cheap hotels, gas stations, and dust. But to you, it is Paradise. Your brilliant plan? You will construct a magnificent chain of casinos and fill them with light. You will manufacture the ultimate dream of easy money and impossible luxury. You will sell-basically-nothing. You are not alone in this plan. In Lords of Vegas, you and your friends play rival developers, building on the Las Vegas Strip. You can get ahead by building the glitziest, most glamorous, and most popular casinos. But you can fall behind by letting your enemy become your boss. 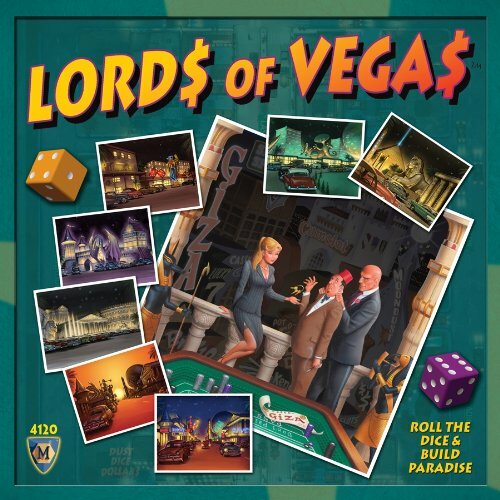 Lords of Vegas is a clever strategy game with all the thrills, risks, and rewards of the casino business. You start out with empty lots, build small casinos, and expand them as your bankroll grows. Your rivals can build next door, and they just might take you over with a clever paint job or a lucky roll of the dice. Buy, sell, trade, and gamble your way to the top as you build your empire along the storied Strip.So come on, roll the dice, and build your piece of Paradise! Who built the first stone statues? The players are part of the exciting story of the mysterious Easter Island, far from any civilization, in the midst of the harsh Pacific. They pay homage to the gods on the cult place Orongo and created with their help the giant stone heads. Who has more muscles than his opponent, the best building sites, and best resources for the construction of the stone colossi? 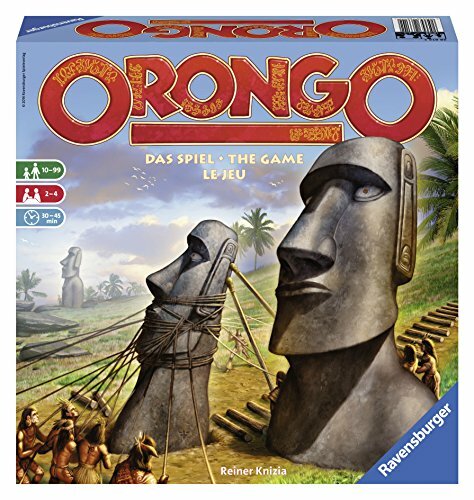 ORONGO is an original bidding and building game with simple rules and easy to play setting. In the geometrical racing game Billabong , players maneuver teams of kangaroos jumping around a "billabong" ("a dead-end channel extending from the stream of a river," a term used in Australia). The board is made up of checkerboard-style squares around the billabong in the middle. On your turn, you move one of your five kangaroos, usually moving it in a jump or series of jumps over the other kangaroos. Jumps can be long; if the kangaroo to be jumped over is five spaces away, for example, the landing space will be five spaces beyond. The other option — to move a kangaroo just one space — is usually used as a positioning tactic for a subsequent move. The first player to get all five kangaroos around the billabong and over the finish line wins. In Kupferkessel Co. ( Copper Kettle , or since it's about witches, Copper Cauldron Co. ) we imagine witches or wizards shopping for ingredients for their magic potions. Your token moves around the perimeter of an array of cards (ingredients) and you pick one from the row or column where you stop. The number on the card you pick dictates how many spaces you move on your next turn. You try to collect sets of four matching ingredients and get penalty points if you have only one of a particular ingredient. The scoring rules can be made more complicated if the players desire, but for most the basic rules are satisfying. A touch of memory is involved since you can see only the last ingredient you picked up on your stack of cards. Game Summary Create a 6x6 grid of ingredient cards (numbered 1-4, 14 ingredient types; 2 each in 5 colors, and the player colors black and white) minus the corners. Place the 2 player pawns on opposite corners. Each player gets a random card (not of their color) in front of them. For the advanced game, players also get 2 recipe cards = bonus points at end of game if you meet the conditions (e.g., at least 3 cards of both ingredients in a color; fewer 4s than the other player, etc.). On your turn, move clockwise as many spaces around the grid as the number showing on your card stack, then take a card in that row and place on top of your stack (may never look through your stack) -- if land on corner, get nothing. Place the top card from the draw deck in the empty spot. If you drew a card with a magic hat/wand icon, take a second turn (max 2 consecutive turns). If you got a card with an exploding icon, the other player places their top card on the bottom of the draw deck (if deck empty, remove card from game instead). The game ends when any row is empty. Then sort your cards by ingredient type and score according to number of each type: - 1 = negative points - 2 = 0 - 3 = sum - 4 = sum + 5 (i.e., 15 VP) - then, if in your own color, double the value - score any bonus points from end-game recipes. Most points wins! Players manage a set of dwarves mining for gems to fulfill randomly distributed contracts. Each turn, players simultaneously decide where to send their dwarves. Four of the dwarves are simply miners and will mine a particular color of gem, depending on placement. Gem prices are set each round, cheaper the more dwarves that are mining it. Players also have two boss dwarves, which can either be shadow dwarves (used to carry out evil actions on other players), or silver dwarves (usually beneficial actions for the player). Assembling the correct assortment of gems and assigning a silver dwarf to fulfill a contract, he can score either his own contract or one of two open contracts. Or he can assign a silver dwarf simply to sell gems for cash. High score when all the contracts are gone wins, but usually someone wins before that happens by hitting 600 points. A Valdora promo tile for Essen 2010 The special board is placed next to the game board. As long as it is next to the game board it can be claimed by discarding different-colored craftsman tiles. At the game end, before scoring, the player that collected the special board is allowed to take one extra turn after the last player finished his turn. Welcome to Football Highlights 2052 ! Football Highlights 2052 is like watching TV highlights of early 21st-century football games, with the game play being full of theme but with no time-outs or commercial breaks and all without bogging down in a play-by-play football simulation. In this quick and interactive game, two players manage their teams, combining both strategy (building your team) and tactics (playing the game) without any downtime. During each half, players alternate playing ten cards to simulate a full game's highlights. Each card represents both an offensive and a defensive play, both of which will be used to resolve your opponent's and your own offensive plays. Do you try to thwart your opponent's threatened offense, or put up a strong offense of your own? The player who makes the best use of their plays will score the most points through touchdowns, field goals, and even safeties to win the game! The "Sechs Sonderaufträge" (Six special commissions) are part of the Abacusspiele spring catalogue 2010 and part 10 in the expansion-series "catalogue edition". With these commissions you have the option to choose where to deliver and which craftman you take for that. Trans Europa & Trans Amerika includes two simple railway games in the same box that use the same rules, but are played on different maps, which provide different playing experiences. In each game, you start each round of play with a secret set of five cities strung across either Europe or the U.S. (depending on the side of the game board you're using) that need to be connected by rail. On your first turn, you place your starting station somewhere on the game board. On each subsequent turn, you place either one or two rails that connect two points on the board; you can place only one rail if you're crossing a river or a mountain ridge with that rail. All of the rails that you place must touch your starting station or connect with other rails in a network that touches your starting station. Thus, each player builds their own network initially, but as soon as those networks connect, you can place rails anywhere off that connected network As soon as a player connects all five of their cities in a network, which could happen on another player's turn, the round ends. Whoever has connected all of their cities scores 4 points; each other player scores 0-3 points depending on how many rails they would need to place to connect all of their cities. You then clear the board, shuffle the cards, and play another round. The first player to score 13 or more points wins! The player who can make the best use of the other players' networks is generally victorious. Trans Europa & Trans Amerika includes 19 special cards that can be used to provide more variety in gameplay. At the start of a round, reveal one of the cards; the effect of this card applies to all players during this round, perhaps with everyone discarding their rose card and needing to connect only four cities, or having a mountain pass count as only one rail played, or placing three rails on a turn, or revealing two of their cards so that everyone can see where others are going in particular parts of the map. The game is cleverly packaged to look like a swimming pool about the size of a paperback book, and around the edge of the pool are 18 spaces. The spaces are filled randomly with the 18 pawns, 3 each of 6 colors, and each player is secretly assigned a color. Your turn consists of picking up one of the pawns, looking at the number (1, 2, or 3) on the bottom, and moving it that many spaces. If it lands on another pawn, it pushes it into the pool! Winner is the last pawn standing. Expansion kit for Die Siedler von Catan (The Settlers of Catan). Includes fifteen expansion scenarios and many variants along with pieces. However, written only in German. 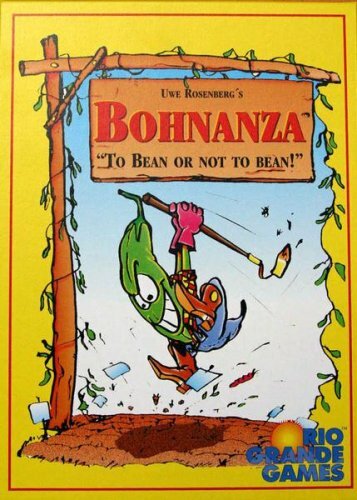 Some editions in the U.S. are available with a set of English translations for the scenarios and variants part of the book enclosed. 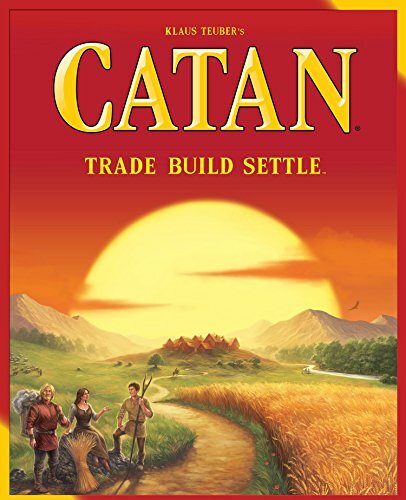 This is an expansion for Die Siedler von Catan (The Settlers of Catan). There are two scenarios that are included, Cheops and Alexander the Great. The first recreates the building of the pyramids ala Settlers, and the second follows the imperial expansion of Alexander the Great. Druids are preparing for a great contest. Who will be the first to restore order to the elements? In ROX , the druid players are presented with sixty cards that lay scattered on the table. Each card is one of five colors with a matching colored totem in the center of the card, and the border of the card has sixteen symbols in a mixture of the five colors. To start a round, each player takes a card from the center, looks at the border to see which color/symbol is most prominent, then takes a card of this color, looks at the border, etc. until the player has placed a total of five cards in front of them. One all players have finished, the first player to finish uses a magic eye card to verify that they made the correct color choices for each card that they placed. If they did, they take the highest scoring card for the round; if not, they get nothing. After a certain number of rounds, the player with the highest score wins. [Careful: there are two similar games with Entdecker in the title. Don't confuse Entdecker with Die Neuen Entdecker (also known as Entdecker: Exploring New Horizons), a different game. In short - if your Entdecker's board has a scout trail leading to native huts, it's not this Entdecker.] Entdecker starts with a blank game board that represents an unexplored sea. Tiles are drawn and placed on squares on the board. As the tiles are placed islands develop on the board and players pay to place settlements, bases, or scouts on these islands in an effort to become the most powerful discoverer of all. Completed islands yield victory points to all who have invested in exploration on an island, but of course the most points go to the player who has established the strongest presence. Players take on the role of cat burglars and use a simultaneous bidding mechanism similar to Raj/Hol's der Geier to get cards that allow them to move up a skyscraper. However, the game system does add several new features to the genre such as sabotage, stealing equipment, and unique "parasite" cards. In addition, the unique 3-d board is modular to allow for different difficulties and game lengths. Wolfgang Kramer developed this variant of 6 Nimmt! (more precisely, the version sold as 6 Nimmt! - Jubiläumsedition ), that added a Zero card to gameplay. This mini-expansion (7 cards) for the 6 Nimmt! - Jubiläumsedition was available at Essen 2005 or through the Amigo website directly if you send in the coupon from the 6 Nimmt! - Jubiläumsedition . The initial version was available at Essen 2005 but was quickly pulled from distribution when it was discovered that the backs of the cards were blue and didn't match either the purple of the regular version of the cards or the golden frame / blue bullhead on the back of the 6 Nimmt! - Jubiläumsedition edition. Some packs were handed out before the error was discovered. 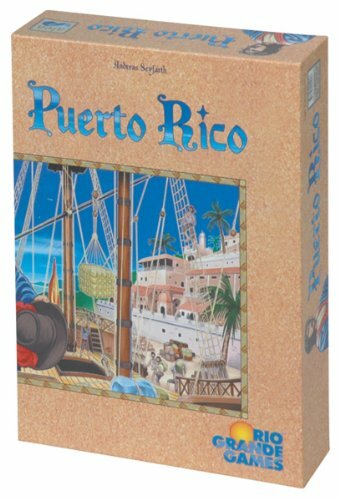 Amigo went back to press and finally released the cards with the correct backs a few months after Essen. The goal of this game is to meld sets of vampires from the six different suits. Once either all the cards are drawn or one player has melds in all six suits, the game is over. The player (or players) with the weakest meld in each of the suits, and non-existent zero-melds count here, is discarded. However, all remaining cards contribute their value (either one or two) to each player's total. Some have described this game as a multi-player version of Lost Cities, which isn't a terrible comparison. Part of the Goldsieber à la Carte line of games. Industrial Waste is a fast but deep game designed by Jürgen Strohm in which the players are running factories. Players buy materials, complete orders and invest money in technology improvements to earn VPs, but they need to keep an eye on their waste output. If players have too much waste in their factory dump they are liable to suffer an environmental disaster and have to pay hefty cleanup costs. Development of technological improvements requiring less waste, fewer resources, and reduced workforce are the key to this game. The game features bidding for resources, hand management and some drafting of cards to gain actions. The first player to grow their factory to a value of twenty triggers the end and the player with the most points wins. El Razul is an expansion for the board game Finca, published by the magazine Spielbox in April 2010 (02/2010). 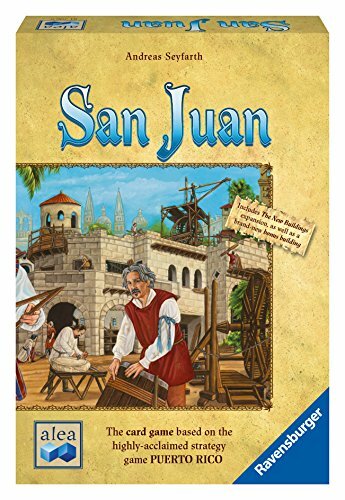 The expansion comprises 10 new tiles: El Razul Person (2 tiles) 2 windmill blades 4 action tiles 2 fruit tiles The rules for this expansion can be found on the internet page from spielbox.de . Katzenjammer Blues is an unusual hybrid of rummy and auction rules, with a couple of strange ideas thrown in about the game ending once 20 points, total, have been scored, and a 5-point penalty for most jokers. It's a quick, cutthroat card game, colorfully decorated with cartoony blues-band cats and mice. Part of the Goldsieber à la Carte line of games. As soon as a coin in the coffer rings, the soul from purgatory springs" —Johann Tetzel, 1465-1519 Mea Culpa is a paradise-and-pandemonium gamer's game that’s all about sins and sinners. Be it at the brothel or at the market, men such as the Pope or the Emperor can be seen hard at work at any time of the day. Even the most miserable miser, though, would be well advised to also strive to get hold of enough precious stones and wine to make sufficient donations towards the Lord's cathedrals. After all, it is through pious generosity that a poor soul can gain the all-important letters of indulgence and be pardoned for a life of greed and lust. When all is said done, what matters is to have sinned just enough to have achieved all goals and gotten away with it, while others took the fall. In more detail, to win, players have to end the game with their "poor souls" closer to heaven's gate than their opponents. Alas, throughout the game these poor souls pretty much exclusively move in the opposite direction, i.e., towards Hell. Only at the very end of the game might players climb back towards heaven, depending on the letters of indulgence that they managed to collect up to that point. The accumulation of these letters of indulgence is each player's primary goal. To this end, they take on the roles of different people: the Pope, the Emperor, the Merchant, or the Little Sinner. Each round, these roles in turn grant them access to different special actions. On their turn, players buy or sell goods on the market, visit the brothel to benefit from personal connections, or secretly donate money and goods to the church. Meanwhile, the construction of the game's three cathedrals proceeds. As soon as a cathedral is fully erected, the church will hand out the all-important letters of indulgence. However, only those who have donated the most in either of three categories will actually receive anything. Many perks that can be used during the game require the players to "sin". Sins are tracked by means of a tally stick and will move the player's poor soul closer to hell. The player who strikes the right balance and picks the right roles at the right time will be able to collect the most valuable letters of indulgence and might stand chance at winning the game. If a player has burdened themselves with too much sin, though, all will ultimately be for naught. The object of this simple card game is to rid yourself of your hand of cards. The deck consists of four suits, two have one through twelve cards, two have one through fifteen cards. The suits are ranked high to low, with the fifteen suits in the middle. Each turn, players have to play a card onto the last card played. In order for the play to be legal, the card played must be 'higher' in either suit or numeric value. If you play a card that beats the last card in both categories (suit and value), then you must play another card with the same restrictions. If you cannot play a card, then you take penalty. The first person to play his entire hand ends the hand, and everyone scores the value of the remaining cards in his hand. During subsequent hands, the player with the highest score (the current loser) can decide to reverse the suit order (mirror it) to make his hand better. Jungle Speed Extension : Contains 80 new cards some of them with new special rules. Some of the new cards allow players to stack their hands on top of the Totem without allowing it to fall or play with the cards of the player on their left! Yedo: Sakoku , a mini-expansion for the Yedo base game, includes a thematic event card that's shuffled together with the other event cards. When the "Sakoku" card is revealed, the church burns down and is covered with the included "burned-down church" tile. From this moment on, players cannot gain Mon from the church. This very simple game is another variation on The Great Dalmuti. Each player receives 10 cards which come in 4 suits (orange and red female + Grey and brown male). The rules state whoever is the most miserable goes first. You can perform 1 of 3 actions on a turn. Play a card that is higher than the top card on the discard pile (which ends your turn), Play a pair of same suit cards whose sum is less than the top card (this does not end your turn and you must then take another action) or draw cards from stock. (You must keep drawing till you draw a male and female card. These cards are shown to the other players. This does end your turn.) Every time you play a pair you skip the next player in turn. If you play 2 pairs you skip the next two players, etc. You can never skip yourself so in a 3-player game if you play 3 pairs, then end your turn by drawing or playing a single card, you then take another turn. When playing a pair you may place them in any order. When the stock is empty you shuffle the draw pile (except for the top card I would presume) and continue play. A hand is won when one person is out of cards. He receives the total points left in all other players hands. The rules state that you play for several rounds. The old kingdom is in danger. Enemy armies are attacking from all directions thanks to the Dark Lord, who seeks to bring eternal darkness across the land. The only chance the players have in Roll for Adventure is to band forces to collect the fabled power stones to complete the magical amulet. If they succeed, they'll save the empire and win the game. However, should even one area fall under the control of the Dark Lord, the players lose the game immediately. In TohuWabohu , a.k.a. Tip Tap , players must race to finger the right items on the table — but winning an item isn't good enough as you need to protect it from being stolen while still hunting for more. In more detail, you set up the game by placing all of the multi-colored and strangely shaped cardboard bits on the table. Each round, one player is the director and takes charge of flipping over a card that depicts one or more of these bits. Everyone races to place a finger on the depicted items first, and once you've placed a finger on an item, you can't move it again. Once all the depicted items are found (assuming they were correctly figured), the fingerers place those items in front of themselves, then the director flips another card. If a card shows an item previously claimed, the owner of that item must secure it with a finger; if they don't, any opponent who touches it first will steal it away. If a player has seven or eight bits in front of them, then the round ends and everyone scores one point for each item that they collected. After playing as many rounds as the number of players, the game ends and whoever has scored the most points wins. Besides attempting to find oil in dusty Texas, players must also try to outbid one another for sales contracts in the oil industry. An oilfield with drilling sites scattered about is spread out before the players, who take their trucks out trying to grab those sites as quickly as possible. Three groups of tiles are laid over the drilling sites, giving a range of value for each site once it has been reached by a player. The deeper a site is into the field the greater its overall yield. But players have to weigh this against creating a constant supply from the smaller yields that are closer at the beginning of the game. Once oil has been produced, players can attempt to sell it on the market. But there are only three companies, and with four players this means that one player will be shut out each turn. Bidding has an interesting element to it in that player's bidding pools are hidden from one another, making it difficult to tell whether a player is bluffing. Unofficial fan expansion of Catan: Cities & Knights. Adds several new aspects to Catan: Cities and Knights. Introduces an Inquisitor token, Religion Development Calendars, Religion Progress card set, Bread commodity cards and Beer commodity cards. While Bread is analogous to Grain (the way Coin is analogous to Ore in Cities and Knights), Beer is a commodity that can only be produced on a Grain intersection when a new Diocese building is present. Beer is used to create Beer Festivals which affect an opponent's Road, Ship, Settlement or City for a period of time; this action can lower the Victory Point total for that opponent! The third edition of Kirche, Glaube & Reformation ("Church, Faith and Reformation") also incorporates another unofficial fan expansion, Hexen, Zauberer & Drachen (Fan expansion to Catan: Cities and Knights) ("Witches, Wizards & Dragons"), which introduces a Wizard token, Magic Development Calendars, Magic Progress card set and Magic commodity cards. Magic commodities can only be collected on a brick intersection when a new Citadel building is present. This combined version requires a custom 12 sided event die (6 barbarian ships and 6 city gates, the last of which is a "wild card" gate allowing the player who rolled the dice to choose the color gate). If played separately, each fan expansion requires a custom 8 or 10 sided event side (4 barbarian ships and 4 city gates or 5 barbarian ships and 5 city gates, the last of which is a "wild card" gate). Adds tactical complexity to the game and game length. Belongs to the Catan Series. Gnadenlos! (Merciless!) 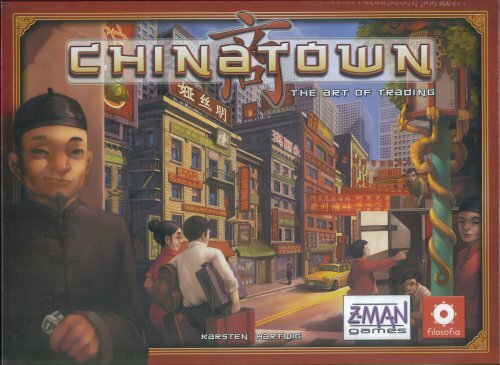 is a game in which players enter a prospecting boom town and try to accumulate the most prestige points. Rather than doing the dirty work themselves, players hire adventurers to pan for their gold, fight their gun battles, and sit in for them in the poker games. Since the money hasn't yet come in, these rough-tough folk are hired merely with pieces of paper - IOUs. But on pay day the IOUs come due, and if a player can't pay off debts, then the vultures swoop in. Players bid for adventurer cards that will be used in various events - Gold Fever, High Noon, and the Poker Game. Each adventurer carries a number (a rating) for each of the three events. When it's time to play out an event, players place an adventurer card face down. All players simultaneously turn the cards over. The adventurer with the highest number pertaining to the event wins; the lowest loses (ties are usually kept as ties, with both receiving the benefits or penalties). In Gold Fever the winner and second highest receive gold, which may be exchanged for prestige points or used to pay off debts. In High Noon, the winner gets to pick back up two IOUs (not necessarily his or her own); the loser is shot and loses the adventurer card. Also the undertaker advances one space along a timing track. In the Poker Game, the winner moves forward on the prestige track; the loser moves backwards. The IOU cards used in bids for the adventurers are placed in rows along the board, each beside one of six dice symbols (showing 1 through 6). When as many rows as there are players in the game are filled, it's Pay Day. A die is rolled and the outermost card beside the corresponding die symbol is turned up. The player who owns that IOU must pay up. This continues until either all cards of one die symbol have been turned up, or a player cannot meet a debt. The unfortunate player in this case gets a vulture chip and moves back 5 spaces on the prestige track. The game ends either when one player has 3 vulture chips; a player reaches or passes the winning space on the prestige track; or the undertaker reaches his final space. When the game ends the player farthest along the prestige track wins. A dice driven game about German politics - players try to be the Chancellor when the game ends. The board consists of a long movement track on which the players advance up the political ranks. Sections of the board have number combinations assigned to them (such as 1-2-3, for instance). Players roll a die and move one of their pawns forward to the best possible positions in the next rank ahead of them. Some fields allow for instant promotions or demotions of others, or for additional rolls. Other fields allow a player to add a minister to the current cabinet. The first player to control three ministers becomes chancellor, losing his/her post only when another player has more ministers. If all minister posts are taken, a player placing a minister removes another player's minister and takes his/her place. Whenever a player cannot use his/her die result, s/he ages by one year. A player reaching the age of 65 is forced to retire from the game - when all players are retired, the player who holds the office of chancellor is the winner. This limited 10th anniversary special edition tin box includes the base game plus the latest expansion from 2006, Künstler & Wohltäter (which wasn´t released separately before Essen 2006). Also included are a nice victory point counter and plastic miniatures of the mill and the knight. If you leave out the plastic inlay, it should be possible to fill in all your Catan - The Card Game expansion cards. Since this collector´s item won´t see an international release anytime soon (if ever ! ), you´ll have to live with the German or Dutch tin box, but could you simply put your own cards into the box of course and that should do the trick ;) Belongs to the Catan Series.